This is a nice ending to a horrible story last week about Cyclone Pam, a category 5 cyclone that swept across several Pacific Island countries before hitting Vanuatu. Lessons to learn from the Melanesian villagers. Destruction in a village on Togoa Island, Vanuatu. Reuters reported that villagers in Vanuatu buried food and fresh water as one of the strongest storms on record bore down on them, fleeing to churches, schools and even coconut drying kilns as 300 kph winds and massive seas tore their flimsy houses to the ground. Despite reports of utter devastation six days after Cyclone Pam pummelled the Pacific island nation, Vanuatu appears to be providing something of a lesson in how to survive a category 5 storm. The United Nations says the official death toll is 11. Many officials anticipate that number will rise once they are able to more thoroughly inspect the outer islands of the scattered archipelago. Still, the absence of a much higher toll has amazed aid workers and those who lived through it. “It’s absolutely unbelievable the death toll is so low,” said Richard Barnes, 43, a property valuer from New Zealand who has lived near the capital Port Vila, on Efate island for seven years. 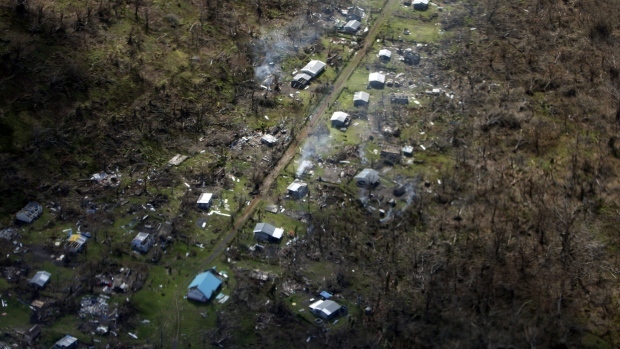 Two days ago, a helicopter flight over the north of Efate revealed scenes of total devastation with at least one coastal village destroyed and no sign of life. When visited a day later, dozens of villagers were back rebuilding with what materials they could find and reporting only one injury, said Barnes, who was on Cayman Island in 2004 when Hurricane Ivan hit. “The resilience is amazing … Everyone is just getting on with it, which was different from Cayman where everyone just sat around waiting for something to be done,” Barnes said. Perched on the geologically active “Ring of Fire”, Vanuatu suffers from frequent earthquakes and tsunamis and has several active volcanoes, in addition to threats from storms and rising sea levels. China joined in with Australia and New Zealand, pledging $4 Million to assist Vanuatu in the recovering process. 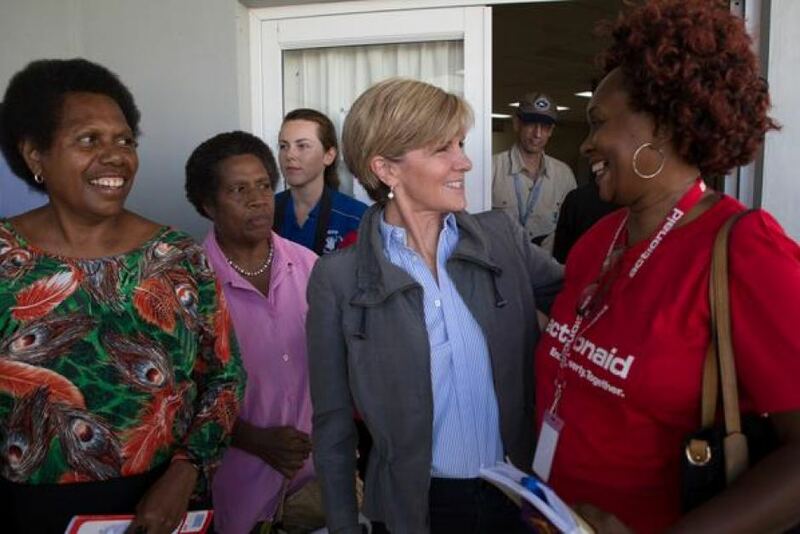 From ABC News, Australian Foreign Minister Julie Bishop has pledged long-term support for Vanuatu during a visit to the Pacific nation ravaged by Tropical Cyclone Pam. Ms Bishop, who flew in on a Royal Australian Air Force flight, toured the command centre for cyclone relief efforts in the capital Port Vila, and visited a school and hospital being rebuilt with Australian assistance. She also met with Vanuatu’s prime minister Joe Natuman and promised on-going support. “Australia has responded quickly to requests from the government of Vanuatu, we have sent more than 11 military planes over with equipment, lifesaving supplies, humanitarian support personnel,” she said. Thousands of people remain homeless in the stricken country, as Vanuatu’s government coordinates relief efforts to get immediate aid to more than 60 inhabited remote islands in the archipelago. It has begun to send out food aid and seedlings to parts of the country hit hardest by Cyclone Pam after a week of assessments and planning. You’re welcome. We love a story which shows how people cope in the face of adversity when all the odds may be against them. The resillience shown by the villagers demonstrate this, the adversity empowers them, it is uplifting and inspiring. Thank you for the heads up re the Fest Napuan Festival we’ll check it out that’s very nice of you to mention it, hugs. Yes they clearly are & it’s good to see. Vanuatu is one of the places where you would have scouted some great musicians in the Fest Napuan Festival. They may still run with the show later this year. Thank you for re-blogging my friend. We can only admire the way people have coped with this great storm but have shown the world how they worked together to survive. As you say, their resilience has been amazing.